Education Secretary Betsy DeVos has called for a "major shift" in how we provide higher education: "We have to give students a much wider venue of opportunity, starting in high school and middle school, to help guide them into a productive future." Critics, though, call this move giving free rein to bad actors. "Basically what these regulations allow is for these institutions that care about nothing but profit to come in and screw students in the name of innovation," says Amy Laitinen, who directs higher education policy at the left-leaning New America Foundation. Accrediting agencies: Who watches the watchdogs? A college must be accredited in order to receive federal funds. But it is independent agencies, not the government, that give that approval. They are the meat inspectors of the higher education world. When accreditors don't do their job, students can suffer. In 2016, the Obama administration withdrew recognition of one of these accreditation agencies, the Accrediting Council for Independent Colleges and Schools, which had certified both Corinthian Colleges and ITT Tech, two enormous for-profit colleges that collapsed in scandal. DeVos reinstated ACICS earlier this year, despite her department's own review finding that the agency failed to comply with 57 of 93 federal quality standards. Now, her department proposes "simplifying the Department's process for recognition and review of accrediting agencies." That could reduce compliance requirements for accreditors, according to Diane Auer Jones, the department's principal deputy undersecretary, as quoted in Inside Higher Ed. 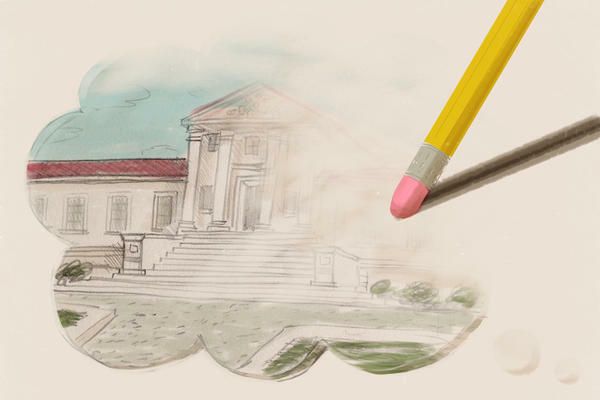 Clare McCann, the deputy director for federal higher education policy at New America, says this could amount to cutting off one leg of the three-legged stool that is college oversight: states, the federal government and accreditors. And if that happens, she says, "the whole thing falls down." Gainful employment: Who pays for degrees that don't pay off? One of the biggest battlegrounds in higher ed policy during the previous administration was a little rule called gainful employment. This imposed limited sanctions on career-training programs that consistently produced graduates whose income was too low relative to their student debt. The for-profit college industry opposed the rule, including in court. Consumer and student advocates hailed it. A memorandum obtained by The New York Times last week suggests the department plans to scrap gainful employment and simply report statistics on debt burden and post-college earnings, as the federal College Scorecard currently does. This week's announcement from the department doesn't include the words "gainful employment" but does propose creating "a single definition for purposes of measuring and reporting job placement rates." A single definition, that is, for career and noncareer programs alike. In 1893, Charles Eliot, president of Harvard, introduced what became the basic unit of a college education: the credit hour. The Obama administration defined it thus: "One hour of classroom or direct faculty instruction and a minimum of two hours of out of class student work each week for approximately fifteen weeks for one semester or trimester hour of credit." College programs currently need to provide a certain number of credit hours of instruction in order to be accredited. The department wants to revise that definition, it says, to "promote greater access for students to high-quality, innovative programs." This is a controversial point. On the one hand, competency-based education is a burgeoning movement both in K-12 and in higher education. Many argue that what matters is not bodies parked in seats but mastery of particular skills and content. That can be demonstrated through direct assessment, independent research, internships, online learning, group projects and in many other ways, over any period of time. Even New America's Laitinen, a critic of the proposed rule changes, wrote a white paper titled, "Cracking the Credit Hour." Linda Rawles, a self-described libertarian and regulatory lawyer who has represented for-profit colleges, says the Obama administration's move to define the credit hour angered groups that often find themselves on opposite sides of issues. "Traditional schools, for example, were not happy," Rawles says. "They thought that was an infringement on their territory, on their ability to decide what good teaching was." On the other hand, there is the quality question. Laitinen notes that if you nix the credit hour without replacing it, while simultaneously loosening oversight from both the feds and accreditors, you could end up with diploma mills. Faculty contact: Where's my teacher? A second standard related to competency-based or direct-assessment programs now under revision is "regular and substantive interaction" with faculty. Under current rules, distance education courses must have a certain amount of student-instructor contact; otherwise, they are mere correspondence courses. Western Governors University, a nonprofit online entity that has been hailed as a pioneer in competency-based education, was dinged by the Department of Education last year for falling afoul of this rule. The department's notice this week also addresses issues with the TEACH Grant program, seeking to "improve outcomes" for recipients. TEACH is a program that offers public-school teachers grants to pay for college or a master's degree in return for committing to teach a high-need subject for four years in a school that serves many low-income families. In recent months, TEACH has been the subject of extensive NPR reporting that revealed widespread mismanagement, resulting in thousands of teachers having their grants unfairly converted to burdensome loans. In June, 19 senators signed a letter to Secretary DeVos, citing NPR's reporting and saying, "It is urgent that these mistakes are fixed." By including TEACH in negotiated rule-making, the Education Department is acknowledging that the grant program needs changing, though it's unclear whether this rewrite, assuming it happens, will address the program's flaws or make whole the teachers who have been saddled with debt. But wait, you say — there are lots of religiously-aligned colleges that already get federal funding in the form of student aid and research grants — Catholic, Jewish, evangelical, to name a few. So what's new? It's hard to say exactly, but the department's notice does call out a relatively small program called GEAR UP that provides money to public K-12 schools, not colleges, to help low-income students prepare for college. And it mentions "faith-based entities," not just "schools." So the potential implication is that this rule change would pave the way to give federal education money to any religious organization. This week, the U.S. Department of Education announced it's going back to the drawing board on some basic quality control rules for higher education. That includes one concept that's been in place for 125 years. The Department of Education says the aim is innovation. But critics fear these changes will give free rein to bad actors. I'm here now with Anya Kamenetz of the NPR Ed Team. Hi, Anya. ANYA KAMENETZ, BYLINE: Hi, Noel. KING: OK, so what is the change? KAMENETZ: So the department is getting the ball rolling on a process called negotiated regulation - or neg reg (ph) for short. Basically over 2019, they'll be rewriting a really long, wonky list of rules that are actually super important because they define in basic terms what a college education is. And they do that for the purpose of trying to shield students from potentially going to very low-quality programs. KING: Oh, that's interesting. So what are some examples? What's on the list? KAMENETZ: So there are these folks called accreditors. They are the independent meat inspectors of the higher ed world. So if we think of, like, higher ed oversight, it's like a three-legged stool. There are states, the federal government, and there are these accreditors. And they want to kind of loosen the rules - make it easier for accreditors to become accreditors. And to get a sense of what's at stake here, the Obama administration had pulled the plug on one of these accreditors that had overseen not one but two giant for-profit colleges that collapsed in scandal. And Education Secretary Betsy DeVos, earlier this year, reinstated that accreditor. So this is a sign of kind of getting softer on the watchdog. KING: OK, so that's really interesting. I imagine there will be people who will say, huh, this seems like it's about helping for-profit colleges. KAMENETZ: Well, there's a lot of indicators that that might be true. On the other hand, some of the moves in this neg reg process have been called for by educational innovators across the board. For example, they're looking at the credit hour. The credit hour has been the basic unit of higher education since at least 1893. So right now, if you want to charge students tuition and have them take out federal loans, you have to supply a certain number of hours of instruction for a certain number of weeks. And, you know, in the age of the Internet, in the age of a lot of adult learners, people are saying that's nonsense. You should certify learning not just time. KING: That actually sounds very rational. So I guess there is an argument here that this could increase innovation - move things into the present day. KAMENETZ: Yes. And some people like that idea. On the other hand, you know, student advocates are saying it's great to let programs experiment. But you can't take your hands off the wheel. If you don't use accreditors or other kinds of regulation to hold colleges accountable for outcomes even if you don't specify how they get there, there's a lot of room for scams. KING: All right, so we've talked about what this means for for-profit colleges. Who else is watching this announcement? KAMENETZ: It's interesting, Noel. There's something buried in here that's kind of like a gift to Trump's evangelical base. This is in the wake of a Supreme Court case last year that kind of paved the way to weaken a little bit the separation between church and state when it comes to education funding. And this announcement calls out that case, and then it mentions this small grant program that is intended to help low-income kids prepare for college. And it says, we're going to look at directing that money not to public school districts but to, quote, faith-based entities. KING: Interesting. NPR's Anya Kamenetz - thanks for keeping an eye on this for us, Anya. (SOUNDBITE OF BUSHY'S "THERE'S A LIGHT") Transcript provided by NPR, Copyright NPR.